"Just Choose IZOKEE: Your expert for Micro-Electronics! One-Stop-Shopping with Various Electronic Modules & Components! " WIFI Development Board, 4M bytes. 1 analog input (3.3V max input). 5V 1A switching power supply onboard. 11 digital input/output pins, all pins have interrupt/pwm/I2C/one-wire and a micro-USB connection. 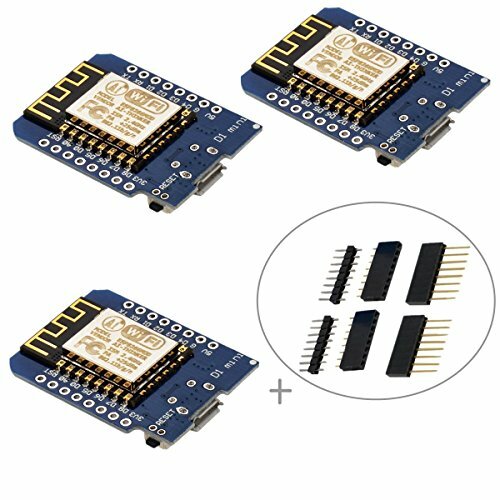 Before you use mini D1 boards, you need set up CH340g driver. - Installing Hardware package "Boards Manager or GIT". We recommend using GIT, you can always get the latest version. This D1 mini module is a mini WIFI board based on ESP-8266EX. This WLAN board contains 11 digital input / output pins, all pins have interrupt / pwm / I2C / 1-wire and a micro-USB connection. Our D1 mini development board is 100% compatible with Arduino WeMos and can be programmed in the Arduino IDE. If you have any questions about this product by IZOKEE, contact us by completing and submitting the form below. If you are looking for a specif part number, please include it with your message.